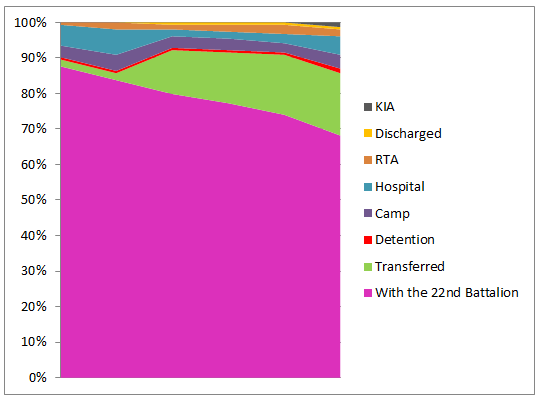 End of month (and year) summary for the 154 men that left Melbourne as the 5th/22nd: 45 men with the 22nd Battalion; 17 transferred to another unit; 2 in detention; 31 in camp; 21 in hospital; 8 returning to Australia; 6 discharged; 23 Killed in Action. 31st December 1916: 2506 Pte Jones admitted to hospital sick – cystitis; 2371 Pte Symonds & 2382 Pte Smith proceeded overseas on Princess Victoria from Folkestone; 2345 Pte McDonagh, 2348 Cpl McLeod & 2505 Pte Rout disembarked HT Wiltshire at Melbourne for discharge. 30th December 1916: 2439 Pte Trompf to hospital sick with trench feet. 29th December 1916: 2328 Sgt Archer returned to duty; 2393 Pte Seccull Absent without Leave at Wareham – 31 days pay deducted; 2492 Pte Sharples returned to duty following hernia operation in Australia, now as 7367 Pte Sharples, 23rd Battalion. 28th December 1916: 2482 Pte Farrington discharged from hospital; 2369 Pte Simkin marched in to No.1 Command Depot, Perham Down; 2425 Pte Trigg rejoined the Battalion from 2nd ADBD. 27th December 1916: 2407 Pte Stevens District Court Martial. Awarded 100 days Detention and forfeiture of 155 days pay. 26th December 1916: 2328 Sgt Archer Wounded in Action – acid abrasions caused by explosion of shell. Nervous, shock, contusion back leg. Evacuated sick to 1 ANZAC Rest station; 2370 Pte Saville to hospital sick with Trench Feet. 25th December 1916: 2398 L-Cpl Strachan and 2457 Pte Yule rejoined the Battalion from 2nd ADBD. 22nd December 1916: 2423 Pte Thomas admitted to 26th General Hospital; 2371 Pte Symonds marched in to No.1 Command Depot, Perham Down. 19th December 1916: 2359 Pte Reynolds discharged from hospital and marched in to No.1 Command Depot, Perham Down. 16th December 1916: 2440 Pte Teichelmann Absent without Leave for 4 days – awarded 72 hours Field Punishment No.2 and forfeiture of 5 days pay; 2387 Pte Scriven admitted to 1st Stationary Hospital, Rouen; 2467 L-Cpl Carter marched in to 2nd ADBD, Etaples. 14th December 1916: 2375 Pte Smith marched in to No.2 Command Depot, Weymouth, from Administration HQ; 2391 Pte Siddell, 2409 L-Cpl Sparks & 2474 Pte Martin marched in to 2nd ADBD, Etaples. 13th December 1916: 2346 Cpl McCormack promoted to Temporary Sergeant; 2462 L-Cpl Alliston promoted to Corporal; 2391 Pte Siddell, 2409 L-Cpl Sparks & 2474 Pte Martin proceeded overseas from 6th Training Battalion from Folkestone on SS Princess Henrietta. 12th December 1916: 2369 Pte Simkin admitted to Brigade Hospital, Perham Down; 2444 Pte Wilson transferred to Bulford Hospital; 2328 Sgt Archer proceeded to join Battalion from 2nd ADBD, Etaples. 11th December 1916: 2437 Pte Thurston marched in to No.1 Command Depot, Perham Down from furlough; 2496 Pte Kendall marched in to 2nd Training Battalion No.5 Camp Durrington; 2492 Pte Sharples completed treatment for hernia in Australia. 9th December 1916: 2353 Pte Price to hospital sick – synovitis of ankle, and scabies; 2496 Pte Kendall marched out of No.4 Command Depot, Wareham, to Larkhill; 2380 Pte Savage & 2410 Pte Scott re-joined the Battalion from 2nd ADBD. 8th December 1916: 2458 Pte Ellis, 2495 Pte Hennessy & 2504 Pte Wakley transferred to 3rd Australian Auxiliary Hospital, Dartford. 6th December 1916: 2481 Pte Fenwick embarked for England on HS ‘Jan Breydel’ at Boulogne & admitted to St.Martins Hospital Bath; 2328 Sgt Archer proceeded overseas to France following officer training; 2457 Pte Yule marched into 2nd ADBD depot at Etaples. 5th December 1916: 2443 Sgt Veel to hospital sick – dysentery; 2362 Pte Roberts & 2394 Pte Stephens discharged from hospital and marched in to No.2 Command Depot, Weymouth. 4th December 1916: 2346 L-Cpl McCormack promoted to Corporal, & 2462 Pte Alliston promoted to L-Cpl; 2455 Pte Ware & 2480 Pte Gall re-joined the Battalion from 2nd ADBD, Etaples. 1st December 1916: 2504 Pte Wakley embarked from Le Havre on HS ‘Gookha’ to England sick – rheumatism; 2394 Pte Stephens transferred to 2nd Australian Auxiliary Hospital, Southall; 2457 Pte Yule to convalescent hospital, Boulogne. 29th November 1916: 2375 Pte Smith discharged from 1st Auxiliary Hospital, Harefield and to two weeks furlough; 2475 Pte Myers rejoined Unit (2nd Pioneers). 28th November 1916: 2474 Pte Martin Absent without Leave for 3 days. Awarded 7 days Close Confinement and forfeiture of 9 days pay; 2465 Pte Bellis admitted to Bath War Hospital; 2418 Pte Skeehan admitted to 1st ADH Military Hospital, Bulford; 2442 Pte Vance marched in to No.1 Command Depot; Perham Down. 27th November 1916: 2465 Pte Bellis embarked at Le Havre for England on HS Asturias – sprained ankle; 2423 Pte Thomas & 2425 Pte Trigg discharged from hospital and marched into 2nd ADBD, Etaples. 25th November 1916: 2454 Pte White Absent without Leave – award deprived of 7 days pay; 2386 Pte Stuckey discharged from hospital to No.2 Command Depot Weymouth; 2380 Pte Savage proceeded to re-join the battalion. 24th November 1916: 2338 Pte Hoobin, 2383 Pte Smith, 2414 Pte Sharples and 2419 Pte Skeggs re-joined the battalion from 2nd ADBD, Etaples. 23rd November 1916: 2504 Pte Wakley admitted 1st Australian General Hospital Rouen with rheumatism; 2482 Pte Farrington admitted 1st Southern General Hospital, Birmingham; 2372 Pte Silver marched in to 2nd ABDB, Etaples, from hospital. 22nd November 1916: 2482 Pte Farrington embarked on HS Ghookhes at Le Havre for England; 2437 Pte Thurston marched in to No.1 Command Depot Perham Down and granted furlough; 2451 Pte Walton marched out to No.4 Command Depot, Wareham. 21st November 1916: 2402 Pte Smyth appointed Lance Corporal; 2398 L-Cpl Strachan transferred to 1st General Hospital, Etretat; 2467 L-Cpl Carter transferred to No.2 Convalescent Depot; 2391 Pte Siddell marched in to No.1 Command Depot Perham Down from furlough; 2464 Pte Bolger marched out from Wareham to No.2 Command Depot Weymouth. 20th November 1916: 2504 Pte Wakley to hospital sick; 2359 Pte Reynolds admitted to 3rd London General Hospital, Wandsworth – Pyrexia; 2394 Pte Stephens admitted to 2nd Southern General Hospital, Bristol; 2362 Pte Roberts transferred to 3rd Auxiliary Hospital Southall suffering with Trench Feet; 2425 Pte Trigg to Convalescence Depot; 2503 Pte Horner marched in to 2nd ADBD, Etaples. 19th November 1916: 2467 L-Cpl Carter admitted to 1st Australian General Hospital, Rouen; 2359 Pte Reynolds embarked Boulogne for England; 2394 Pte Stephens embarked on ‘Dunlace Castle’ at Le Havre for England; 2503 Pte Horner proceeding overseas from Folkestone on SS ‘Onward’. 18th November 1916: 2385 Pte Simons admitted to 4th Southern General Hospital, Plymouth; 2372 Pte Silver transferred to 2nd Convalescent Depot, Rouen; 2377 Pte Smith admitted to 1st Australian Dermatological Hospital, Bulford. 17th November 1916: 2467 L-Cpl Carter Wounded in Action – shell wound right arm; 2396 Pte Swift promoted to Corporal; 2423 Pte Thomas admitted to hospital sick – myalgia; 2480 Pte Gall & 2475 Pte Myers marched in to 2nd ADBD. 16th November 1916: 2356 L-Cpl Quinn Died of Wounds at 36th CCS, Heilly; 2490 Pte Myers, with 2nd Pioneers, Died of Wounds at 1st Anzac Medical Dressing Station; 2385 Pte Simons embarked at Rouen on HS ‘Formosa’ for England; 2451 Pte Walton Absent without Leave at Perham Down – awarded 7 days Close Cofinement and forfeiture of 2 days pay; 2480 Pte Gall proceeding overseas to France on SS ‘Victoria’ via Folkestone; 2483 Pte West re-joined the Battalion. 15th November 1916: 2356 L-Cpl Quinn Wounded in Action, shell wound right thigh; 2362 Pte Roberts & 2427 Cpl Topliff admitted to Beaufort War Hospital – trench feet; 2386 Pte Stuckey admitted 3rd Auxiliary Hospital Dartford – lumbago; 2418 Pte Skeehan marched in to No.1 Command Depot, Perham Down; 2428 Pte Tullett Taken on Strength of 1st Anzac Corps School. 14th November 1916: 2392 Pte Sloss, with 2nd Pioneers, Killed in ActionKilled in Action; 2490 Pte Myers, with 2nd Pioneers, Wounded in Action; 2394 Pte Stephens admitted to 3rd Stationary Hospital, Rouen; 2362 Pte Roberts, 2386 Pte Stuckey & 2427 Cpl Topliff embarked at Le Havre on HS ‘Asturias’ for England with oedema of feet (Trench Feet). 13th November 1916: 2372 Pte Silver Wounded in Action (2nd occasion) – gunshot wound to head, to 5th AFA; 2394 Pte Stephens Wounded in Action – shrapnel wound to leg and buttocks, and admitted to 38th CCS, Heilly; 2383 Pte Smith & 2419 Pte Skeggs marched in to 2nd ADBD, Etaples from England. 12th November 1916: 2459 Pte Bishop Killed in Action; 2425 Pte Trigg transferred to 12th General Hospital, Rouen; 2410 Pte Scott & 2455 Pte Ware proceeding overseas to France from Folkestone on SS ‘Victoria’; 2345 Pte McDonagh, 2348 Cpl McLeod & 2505 Pte Rout discharged from 1st Auxiliary Hospital for return to Australia on HT ‘Wiltshire’ from Portland. 11th November 1916: 2398 L-Cpl Strachan and 2481 Pte Fenwick transferred to 1st General Hospital, Etretat; 2442 Pte Vance discharged from hospital to furlough; 2414 Pte Sharples proceeding overseas from 6th Training Brigade. 9th November 1916: 2398 L-Cpl Strachan to 36th CCS hospital sick – oedema of feet; 2483 Pte West to hospital sick – bronchial catarrh. 8th November 1916: 2338 Pte Hoobin to hospital sick – blistered heel; 2482 Pte Farrington to hospital sick – oedema of feet; 2474 Pte Martin marched in to No.1 Command Depot, Perham Down, and later that day went Absent without Leave for 3 days. Awarded 7 days Close Confinement. 6th November 1916: 2385 Pte Simons to hospital with trench feet; 2387 Pte Scriven to hospital with rheumatism; 2391 Pte Siddell discharged from hospital to furlough. 4th November 1916: 2475 Pte Myers to 2nd Australian Field Ambulance sick – inflamed tonsils; 2464 Pte Bolger marched out of 2nd Auxiliary Hospital to No.4 Command Depot, Wareham. 3rd November 1916: 2395 Pte Sheehey marched out from 1st West General Hospital to 3rdAuxiliary Hospital, Dartford; 2487 Pte Payne & 2496 Pte Kendall (60th Battalion) marched in to No.4 Command Depot, Wareham. 2nd November 1916: 2351 Pte McIntosh transferred from Weymouth to No.4 Command Depot, Wareham; 2364 Pte Roberts marched into No.1 Command Depot Perham Down from Weymouth; 2412 Pte Smith – District Court Martial: charged with being Absent without Leave from 24th August to 27th September. Awarded 160 days detention and forfeiture of 110 days pay. Attempting to escape while in custody. Awarded 28 days Field Punishment No.2; 2486 Pte Barton Absent without Leave for 14 days. Awarded 10 days detention and forfeiture of 24 days pay. 1st November 1916: 2464 Pte Bolger transferred from Chatham Military Hospital to 2nd Australian Auxiliary Hospital, Southall. 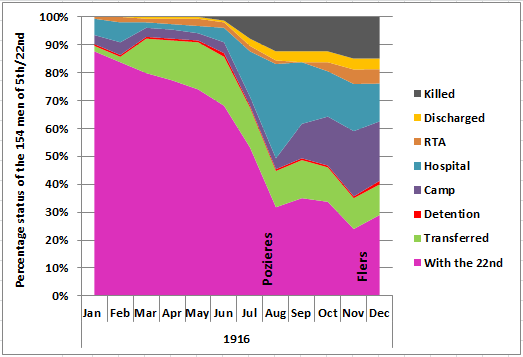 Image shows the change in status of the 154 men from the 5th/22nd after they were Taken on Strength into the 22nd Battalion on 8th January 1916 to the end of October 1916. 31st October 1916: 2369 Pte Simkin reported to No.1 Command Depot, Perham Down. 30th October 1916: 2348 Cpl McLeod reported to 1st Auxiliary Hospital, Harefield after furlough; 2451 Pte Walton discharged from hospital. 27th October 1916: 2371 Pte Symonds & 2393 Pte Seccull marched in to No.4 Command Depot, Wareham; 2397 Pte Samways Absent without Leave, Rollestone. Deprived 12 days pay. 25th October 1916: 2nd Lieut. Kilduff, having been transferred to the 2nd Pioneer Battalion in May crosses the channel to England and is transferred to the Pioneer Training Battalion. 24th October 1916: 2458 Pte Ellis admitted to 26th General Hospital – amputation of 3 toes; 2474 Pte Martin discharged from hospital to furlough. 23rd October 1916: 2328 Sgt Archer passed as qualified for commission in Infantry and promoted to 2nd Lieutenant; 2375 Pte Smith transferred to 1st Auxiliary Hospital, Harefield. 22nd October 1916: 2409 Pte Sparks marched in to No.6 Training Battalion from No.1 Command Depot Perham Down. 19th October 1916: 2371 Pte Symonds & 2393 Pte Seccull marched in to No.1 Command Depot Perham Down from furlough. 18th October 1916: 2428 Pte Tullett marched in to 2nd ADBD Etaples. 17th October 1916: 2402 Pte Smyth rejoined the battalion; 2345 Pte McDonagh, 2469 Pte Edwards & 2505 Pte Rout transferred to 1st Auxiliary Hospital, Harefield. 16th October 1916: Having been wounded at Pozieres and with injuries that were too serious for a return to active service,2334 Pte Goodwin, 2360 Pte Ross, 2361 Pte Ramsay, 2403 Pte Salter, and 2473 Pte MacDonald board the HS Karoola at Southampton for return to Australia and discharge; 2369 Pte Simkin discharged from hospital to furlough; 2458 Pte Ellis while at hospital goes absent while on active service – deprived of 1 days pay. 14th October 1916: 2359 Pte Reynolds transferred to Hazebrook; 2334 Pte Goodwin discharged from hospital and transferred to Weymouth for return to Australia; 2348 Cpl McLeod discharged from 1st Auxilary Hospital, Harefield to furlough. 13th October 1916: 2428 Pte Tullett transferred to 3rd Canadian General Hospital, Boulogne; 2457 Pte Yule admitted to hospital – deafness; 2458 Pte Ellis admitted to 2nd Australian Rest Station with sore feet; in England: 2382 Pte Smith, 2352 Pte Ponton, 2487 Pte Payne marched into No.3 Command Depot Bovington Camp, Wool; 2397 Pte Samways marched into 6th Training Battalion Rollestone from No.2 Command Depot, Weymouth; 2377 Pte Smith admitted to Brigade Hospital, Bulford. 12th October 1916: 2359 Pte Reynolds admitted to hospital – scabies. 11th October 1916: 2328 Sgt Archer attended Officer Cadet training course in Ayrshire, Scotland. 10th October 1916: 2413 Pte Sullivan marched in to 6th Training Battalion Rollestone from No.1 Command Depot, Perham Down. 8th October 1916: 2428 Pte Tullett (with 8th Battalion) admitted to hospital sick – myalgia. 5th October 1916: 2400 Pte Sawyer rejoined the Battalion from 2nd ADBD, Etaples. 2nd October 1916: 2346 L-Cpl McCormack promoted to Temporary Corporal; 2357 Cpl Robbins promoted to Sergeant; 2443 Temp Sgt Veel promoted to Sergeant; 2371 Pte Symonds marched in from hospital to No.1 Command Depot Perham Down; 2486 Pte Barton marched in to No.1 Command Depot Perham Down from hospital, and granted furlough. 1st October 1916: 2328 Sgt Archer placed on supernumery list attending officers cadet course; 2406 Pte Saunders transferred from 2nd Tunnelling Company and Taken on Strength to 2nd Pioneers; 2407 Pte Stevens Absent without Leave for 3 days while at Perham Down, and escaping while in confinement. Image shows the change in status of the 154 men from the 5th/22nd after they were Taken on Strength into the 22nd Battalion on 8th January 1916 to the end of September 1916. 30th September 1916: 2407 Pte Stevens marched in from No.1 Command Depot and Taken on Strength to 6th Training Battalion; 2393 Pte Seccull discharged from hospital and marched in to No.1 Command Depot, Perham Down; 2464 Pte Bolger marched in to 2nd ADBD; 2333 Pte Gibson, 2392 Pte Sloss and 2408 Pte Spicer transferred from 2nd Australian Tunnelling Company and Taken on Strength to 2nd Pioneer Battalion; Lieut. Evans , with the 8th Battalion, Mentioned in Dispatches for participation in a very successful raid on the enemy trenches. 25th September 1916: 2352 Pte Ponton marched in to No.1 Command Depot Perham Down; 2409 Pte Sparks granted furlough; 2427 Pte Topliff admitted to 5th Field Ambulance – oedema right eye; 2458 Pte Ellis admitted to 5th Field Ambulance with Gastro-enteritis. 23rd September 1916: 2413 Pte Sullivan marched in to No.1 Command Depot, Perham Down; 2403 Pte Salter transferred to 1st Auxiliary Hospital, Harefield. 22nd September 1916: 2409 Pte Sparks discharged from hospital and marched in to No.1 Command Depot, Perham Down. 21st September 1916: 2419 Pte Skeggs discharged from hospital and marched in to No.1 Command Depot, Perham Down. 20th September 1916: 2362 Pte Roberts rejoined the 22nd Battalion in the Field; 2410 Pte Scott discharged from hospital and marched in to No.1 Command Depot, Perham Down. 18th September 1916: 2382 Pte Smith granted furlough then to No.1 Command Depot, Perham Down; 2464 Pte Bolger to No.6 Convalescent Depot, Etaples. 15th September 1916: 2403 Pte Salter, 2482 Pte Farrington and 2483 Pte West Awarded Military Medal for duties as stretcher-bearers during the fighting at Pozieres; 2487 Pte Payne discharged from hospital and marched in to No.2 Command Depot, Weymouth; 2351 Pte McIntosh transferred to 2nd Australian Auxiliary Hospital Southall from Wandsworth. 13th September 1916: 2391 L-Cpl Siddell and 2451 Pte Walton transferred to Convalescent Camp, Eastbourne. 12th September 1916: 2496 Pte Kendall discharged from hospital to No.1 Command Depot, Perham Down. 9th September 1916: 2419 Pte Skeggs embarked on HS ‘Dieppe’ at Calais for England, and admitted St.Lukes War Hospital, Halifax; 2407 Pte Stevens transferred to 1st Australian Auxiliary Hospital, Harefield; 2474 Pte Martin transferred to Woodcote Hospital Epsom. 7th September 1916: 2444 Pte Wilson admitted 5th Southern General Hospital Portsmouth. 6th September 1916: 2414 Pte Sharples transferred to No.1 Command Depot, Perham Down; 2439 Pte Trompf discharged from hospital and marched in to 2nd ADBD, Etaples; 2427 Pte Topliff Promoted to Corporal; 2444 Pte Wilson embarked for England on HS ‘Asturias’; 2357 L-Cpl Robbins admitted to No.23 General Hospital, Etaples sick – abscess; 2360 Pte Ross transferred to 1st Australian Auxiliary Hospital, Harefield. 5th September 1916: 2397 Pte Samways marched into No.2 Command Depot Weymouth from Harefield Hospital; 2413 Pte Sullivan granted furlough; 2364 Pte Roberts discharged from hospital. 4th September 1916: 2357 L-Cpl Robbins promoted to Corporal; 2414 Pte Sharples transferred to 1st Australian Auxiliary Hospital, Harefield; 2444 Pte Wilson admitted 8th General Hospital, Rouen; 2416 Pte Stevenson Absent without Leave – award 7 days Field Punishment No.2 and forfeiture of 9 days pay. 3rd September 1916: 2400 Pte Sawyer admitted to 11th General Hospital, Camiers with malaria; 2387 Pte Scriven charged with being in Doullens without a pass – awarded 168 hours Field Punishment No.2; 2444 Pte Wilson Wounded in Action – gunshot wound to leg, and transferred to 49th Casualty Clearing Station. 2nd September 1916: 2493 Pte Batton awarded Military Medal for services rendered during the recent fighting at Pozieres 5th August; 2361 Pte Ramsay condition described as seriously ill; 2397 Pte Samways transferred to 1st Australian Auxiliary Hospital Harefield; 2395 Pte Sheehey to 18th General Hospital, Camiers, sick. 1st September 1916: 2401 Pte Sheldon discharged from hospital and marched in to No.2 Command Depot, Weymouth; 2474 Pte Martin embarked at Calais on HS ‘Brighton’ for England, and admitted to Guildford Hospital; 2486 Pte Barton admitted to 5th Northern General Hospital, Leicester; 2504 Pte Wakley, following earlier Field General Courts Martial, Divisional HQ allows sentence to be remitted. Image shows the change in status of the 154 men from the 5th/22nd after they were Taken on Strength into the 22nd Battalion on 8th January 1916 to the end of August 1916. 31st August 1916: 2328 Cpl Archer Promoted to Sergeant; 2505 Pte Rout admitted 3rd London General Hospital, Wandsworth; 2486 Pte Barton embarked from Boulogne on HS ‘St.David’ for England. 30th August 1916: 2362 Pte Roberts transferred from 1st Anzac Rest Station and admitted to 35th Casualty Clearing Station – shell shock; 2505 Pte Rout embarked for England from Le Havre on HS ‘Makim’; 2486 Pte Barton admitted to 3rd Canadian General Hospital, Boulogne; 2481 Pte Fenwick discharged from hospital to duty. 29th August 1916: 2410 Pte Scott embarked at Le Havre for England on HS ‘Asturias’ – pneumonia, and admitted 3rd London General Hospital, Wandsworth; 2461 Pte Lamont transferred to 6th Field Ambulance; 2486 Pte Barton Wounded in Action – Gunshot Wound leg, admitted to 3rd CCS. 28th August 1916: 2346 L-Cpl McCormack, 2459 Pte Bishop and 2471 Pte Gordon re-joined the 22nd Battalion from 2nd ADBD; back in Australia 2492 Pte Sharples admitted to hospital for hernia operation. 27th August 1916: 2469 Pte Edwards embarked at Boulogne on HS ‘St.Denis’ for England, and admitted to 2nd Eastern Hospital, Brighton. 26th August 1916: 2400 Pte Sawyer Wounded in Action – shrapnel wound in finger. 23rd August 1916: 2412 Pte Smith Taken on Strength of 6th Training Battalion from No.1 Command Depot, Perham Down. 20th August 1916: 2348 Cpl McLeod admitted 2nd Birmingham Hospital, Lichfield; 2397 Pte Samways departed Calais for England on HS ‘Newhaven’; 2353 Act Cpl Price Absent without Leave, forfeiture of 32 days pay. 19th August 1916: 2345 Pte McDonagh admitted 3rd London General Hospital, Wandsworth; 2348 Cpl McLeod, 2413 Pte Sullivan and 2473 L-Cpl MacDonald embarked on HS ‘Dieppe’ from Calais for England – Pte Sullivan admitted to War Hospital, Colchester, Pte MacDonald admitted to Colchester General Military Hospital. 18th August 1916: 2345 Pte McDonagh embarked at Boulogne on HS ‘St. Andrew’; 2464 Pte Bolger admitted to hospital sick – piles, lumbago, sciatica; 2400 Pte Sawyer and 2483 Pte West rejoined 22nd Battalion. 17th August 1916: 2462 Pte Alliston admitted to 11th General Hospital, Camiers sick – middle ear injury; 2479 Pte Wilson marched in to 2nd ADBD from England. 16th August 1916: 2455 Pte Ware admitted Lord Derby War Hospital Warrington; 2438 Pte Tripp re-joined the 22nd Battalion from hospital. 11th August 1916: 2440 Pte Teichelmann re-joined the Battalion; 2414 Pte Sharples admitted to 3rd London General Hospital, Wandsworth; 2351 Pte McIntosh embarked Boulogne for England on HS ‘St.George’, and admitted to 3rd London General Hospital, Wandsworth; 2380 Pte Savage and 2438 Pte Tripp discharged from hospital to 2nd ADBD. 8th August 1916: 2361 Pte Ramsay admitted 3rd Canadian General Hospital, Camiers; 2375 Pte Smith, 2495 Pte Hennessey and 2503 Pte Horner embarked from Boulogne on HS Cambria for England; 2383 Pte Smith admitted 3rd London General Hospital, Wandsworth; 2349 Pte McCarthy admitted to 8th Stationary Hospital, Wimereux; 2409 Pte Sparks admitted 8th General Hospital, Rouen; meanwhile 2410 Pte Scott disembarked HMT Franconia at Marseille having arrived from Egypt. 7th August 1916: 2361 Pte Ramsay Wounded in Action; Shell wound – right buttock, sacroiliac fracture; gunshot wound scapula; 2374 Pte Schinck, 2431 Pte Tatnall admitted to 1st Anzac Rest Station – shell shock; 2375 Pte Smith and 2495 Pte Hennessey admitted to 8th Stationary Hospital, Wimereux; 2383 Pte Smith embarked at Rouen on HS St.David for England; 2413 Pte Sullivan admitted to 3rd Casualty Clearing Station; 2469 Pte Edwards transferred to 2nd Canadian General Hospital, Boulogne. 5th August 1916: On the night of the 4th/5th August 1916, the 22nd Battalion went ‘over the top’ for the first time in the First World War, with all four Companies attacking the German Second Line at Pozieres known as OG1 and OG2. Of the 79 men of the 5th/22nd that went into attack that night, 33 would become casualties: 2355 Pte Quinn, Killed in Action; 2411 Pte Sellwood, Killed in Action; 2415 Pte Shaw Killed in Action; 2433 Pte Taylor, Killed in Action; 2435 Pte Turner (Hahn), Killed in Action; 2334 Pte Goodwin, Wounded in Action – gunshot wound right arm and lower left leg; 2345 Pte McDonagh , Wounded in Action – gunshot wound left elbow and left leg compound fracture; 2348 Cpl McLeod, Wounded in Action – gunshot wound head and chest (severe). Fractured parietal bone; 2349 Pte McCarthy, Wounded in Action – gunshot wound arms and legs (serious); 2351 Pte McIntosh, Wounded in Action – gunshot wound in buttock; 2352 Pte Ponton, Wounded in Action – gunshot wound to hand; 2371 Pte Symons, Wounded in Action – Gunshot wound shoulder and back, and admitted to 11th General Hospital, Camiers; 2372 Pte Silver, Wounded in Action; 2375 Pte Smith, Wounded in Action – gunshot wound thigh and thumb; 2382 Pte Smith, Wounded in Action – Gunshot wound thigh; 2383 Pte Smith, Wounded in Action – gunshot wound face and left thigh; 2388 Pte Schwab, Wounded in Action – gunshot wound head and legs; 2393 Pte Seccull, Wounded in Action – Gunshot wound to shoulder, hip, knee and hand; 2397 Pte Samways, Wounded in Action – Gunshot Wound right foot and right hip, admitted to 3rd CCS, Puchevillers and then to 22nd General Hospital; 2407 Pte Stevens, Wounded in Action – gunshot wound left foot, admitted to No.3 CCS; 2409 Pte Sparks, Wounded in Action – gunshot wound to left shoulder and abdomen, admitted to 44th CCS, Puchevillers; 2413 Pte Sullivan, Wounded in Action – gunshot wound arm and right thigh; 2414 Pte Sharples, Wounded in Action – gunshot wound left arm; 2427 L-Cpl Topliff, Wounded in Action – Shell Wound back, and admitted 1stAnzac Rest Station; 2437 Pte Thurston, Wounded in Action – Gunshot Wound right leg, and admitted 44th CCS; 2455 Pte Ware, Wounded in action – gunshot wound to the head; 2460 Pte Bain, Wounded in Action – gunshot wound face and leg (mild) and admitted to 3rd CCS; 2473 L-Cpl MacDonald, Wounded in Action – gunshot wound fractured right arm and shell shock; 2480 Pte Gall, Wounded in Action – Gunshot Wound buttocks; 2481 Pte Fenwick, Wounded in Action – Gunshot Wound forearm; 2487 Pte Payne, Wounded in Action – Gunshot Wound right hand, and admitted 3 CCS; 2495 Pte Hennessy, Wounded in Action – Gunshot Wound leg (severe); 2505 Pte Rout, Wounded in Action – gunshot wound to chest (severe), and admitted to 44th CCS; Elsewhere, 2391 Pte Siddell admitted Bevan Military Hospital, Sandgate Kent and then Shornecliffe Military Hospital; 2451 Pte Walton admitted to Beechboro Park Hospital. 4th August 1916: 2368 Pte Simkin Wounded in Action – gunshot wound abdomen and admitted to 3rd CCS, Puchevillers; 2469 Pte Edwards Wounded in Action – shrapnel ball shell wound back, and admitted to 44th CCS, Puchevillers; 2391 Pte Siddell and 2451 Pte Walton embarked on HS St. David from Boulogne for England; 2403 Pte Salter admitted to 2nd General Hospital Bristol. 2nd August 1916: 2451 Pte Walton Wounded in Action – gunshot wound leg and admitted to 44th Casualty Clearing Station, Puchevillers; 2391 Pte Siddell transferred to 13th General Hospital Boulogne; 2403 Pte Salter embarked on HS St. Patrick at Boulogne for England; 2442 Pte Vance embarked on HS Dieppe at Calais for England; 2496 Pte Kendall (60th Battalion) embarked at Calais on HS Newhaven for England, and admitted to Northern General Hospital Sheffield; 2412 Pte Smith transferred from 1 AAH, Harefield to No.1 Command Depot, Perham Down; 2471 Pte Gordon discharged from No.20 General Hospital, Camiers to Base Details 2nd Australian Division Base Depot, Etaples; 2377 Pte Smith and 2410 Pte Scott embarked from Alexandria, Egypt on HMT Franconia destination Marseille. 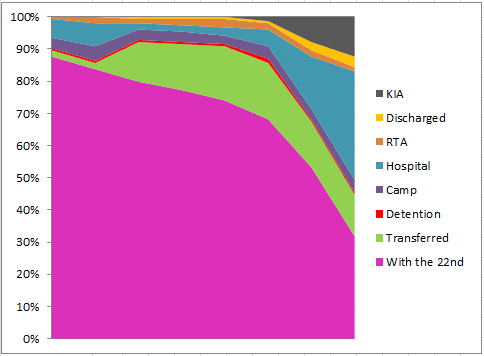 Image shows the change in status of the 154 men from the 5th/22nd after they were Taken on Strength into the 22nd Battalion on 8th January 1916 to the end of July 1916. 30th July 1916: 2445 Pte Wells Died of Wounds at 3rd Casualty Clearing Station, Puchevillers; 2346 Pte McCormack, 2380 Pte Savage and 2438 Pte Tripp admitted to No.23 General Hospital, Etaples; 2364 Pte Roberts admitted Rust Hall Voluntary Aid Detachment Hospital, Tunbridge Wells – gas and shock; 2369 Pte Simkin admitted to 3rd CCS, Puchevillers; 2474 Pte Nelson to Field Ambulance; following the relief from the front line to the ‘quieter’ rest area of Sausage Valley 2398 Pte Strachan, 2409 Pte Sparks, 2467 Pte Carter and 2473 Pte MacDonald are appointed Lance Corporals. The 22nd Battalion was relieved on the night of the 29th/30th July and retired to the ‘quiet’ of Sausage Valley. Of the 105 men of the 5th/22nd that had entered the battle, 8 men had been killed, 22 had been wounded in action including 7 with shell shock. The scene during this first tour was chaotic and and as a result many of the men that were killed or wounded were given the date range of 27th July – 4th August 1916 including: 2331 Pte Gardiner, killed in action; 2344 Pte Middleton, killed in action; 2358 Pte Rowan, killed in action; 2488 L-Cpl Robbins, MM, killed in action; 2478 Pte Wilson, killed in action; 2507 Pte Wardle, killed in action; 2359 Pte Reynolds, wounded in action; 2369 Pte Simkin, wounded in action – gunshot wound right leg and left thigh; 2374 Pte Schinck, wounded in action – neurasthenia (shell shock); 2380 Pte Savage, wounded in action – shell wound, left cheek; 2391 Pte Siddell, wounded in action – shell shock; 2402 Pte Smyth, wounded in action – neurasthenia (shell shock); 2431 Pte Tatnall, wounded in action – shell shock; 2438 Pte Tripp, wounded in action – gunshot wound face and left arm; 2440 Pte Teichelmann, wounded in action – shell shock; 2442 Pte Vance, wounded in action; 2445 Pte Wells, wounded in action; 2459 Pte Bishop, wounded in action – shell wound to shoulder; 2474 Pte Martin, wounded in action – gunshot wound arm and ankle; 2503 Pte Horner, wounded in action – gunshot wound shoulder and buttock. Meanwhile 2nd Lieutenant Evans, having been transferred to the 8th Battalion, in Egypt, was promoted to Lieutenant after the 8th’s tour of the front line at Pozieres. 25th July 1916: 2395 Pte Sheehey joined Sea Transport Section. 21st July 1916: 2427 Pte Topliff promoted to Lance Corporal; 2496 Pte Kendall having been wounded at Fromelles admitted 30th General Hospital; 2502 Pte Sharples having been returned to Australia following a Field General Courts Martial was discharged from the AIF. 19th July 1916: The worst day in Australian military history with 5,533 casualties for the AIF 5th Division as they took part in the disastrous Battle of Fromelles. Included within the casualties were all three members of the 5th/22nd that were transferred to the 60th Battalion while in Egypt: 2390 Pte Silver and 2477 Pte Sheldrick were killed in action; 2496 Pte Kendall was wounded in action. 18th July 1916: 2451 Pte Walton charged with being Absent without Leave. Awarded 168 hours Field Punishment Number 2. 17th July 1916: 2416 Pte Stevenson (2nd Pioneers) charged with being drunk, with forfeiture of three days pay. 16th July 1916: 2471 Pte Gordon rejoins the Battalion. 15th July 1916: 2488 Pte Robbins, MM, Absent without Leave from 9am parade, and awarded 72 hours Field Punishment Number 2; 46 year-old 2479 Pte Wilson having been discharged from hospital with trench fever is transferred to England as kit bag guard. 14th July 1916: 2333 Pte Gibson, 2392 Pte Sloss, 2406 Pte Saunders and 2408 Pte Spicer transferred to Australian 2nd Tunnelling Company; 2362 Pte Roberts and 2374 Pte Schinck having been assigned to Trench Mortar Battery are transferred back to the 22nd Battalion. 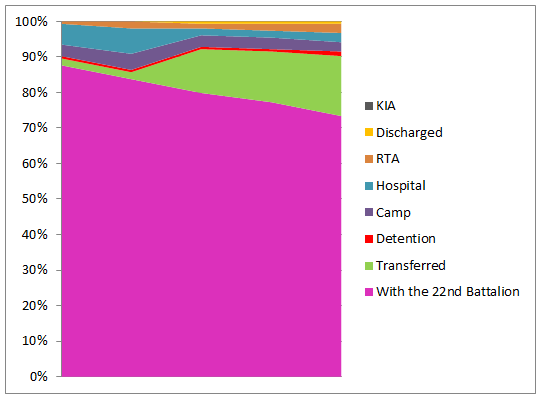 12th July 1916: 2412 Pte Smith transferred from Greylingwell War Hospital, Chichester and admitted to 1st Australian Auxiliary Hospital Harefield; 2418 Pte Skeehan transferred to Epsom Military Hospital; 2497 Pte Kerr committed to prison in the field to serve 5 years Penal Servitude awarded by Field General Courts Martial on 31st May 1916. 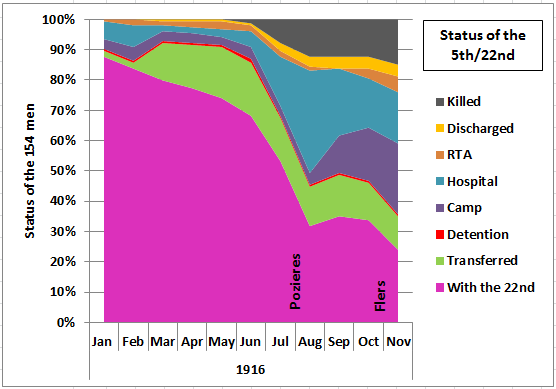 11th July 1916: 2362 Pte Roberts Absent without Leave in the field – forfeit of 30 days pay; 2471 Pte Gordon admitted to No.1 NZ Stationary Hospital, Amiens with tonsilitis; 2401 Pte Sheldon admitted to 2nd Western General Hospital, Manchester. 10th July 1916: 2401 Pte Sheldon embarked for England at Boulogne on HS St. Denis with injured knee; 2492 Pte Sharples embarked for return to Australia on HT Clan McGillivray for hernia operation, along with 2501 Pte Shave with rheumatism and Valvular Heart Disease. 9th July 1916: 2401 Pte Sheldon admitted to No.13 Stationary Hospital Boulogne – synovitis of knee. Pte Sheldon fell on boat coming from Australia and twisted knee – knee continually locking due to damaged cartilage. Invalided from Bois Grenier 8th July after an accident in the trench. 8th July 1916: 2358 Pte Rowan charged with drunkenness and breaking from ranks while on a march. Awarded 28 days Field Punishment Number 2. 7th July 1916: 2357 Pte Robbins promoted to Lance Corporal. 5th July 1916: 2495 Pte Hennessy Absent without Leave in the field. Awarded 12 days Field Punishment Number 2 and total forfeiture of 14 days pay; 44 year-old 2499 Pte Phillips having returned to Australia is discharged medically unfit with rheumatism. 4th July 1916: 2416 Pte Stevenson (2nd Pioneers) Absent without Leave. Awarded 14 days Field Punishment Number 2 and forfeiture of 14 days pay. 3rd July 1916: 2412 Pte Smith embarked on HS Jan Breydel at Boulogne and upon disembarkation admitted to Graylingwell War Hospital Chichester; having returned to Australia 2484 Pte Yarrow is discharged from the AIF. 2nd July 1916: Having been wounded in action 2412 Pte Smith is admitted to No.3 Canadian General Hospital Boulogne; 2382 Pte Smith rejoined the Battalion from hospital, and 2474 Pte Martin rejoined from Base. 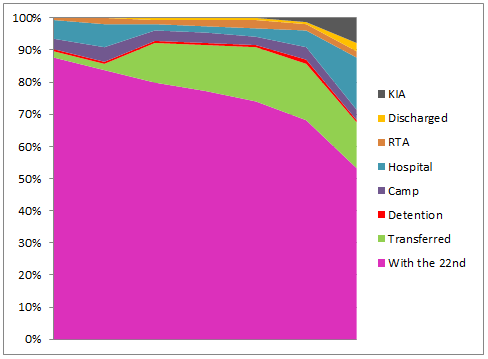 End of month summary for the 154 men that left Melbourne as the 5th/22nd: 105 men with the 22nd Battalion; 27 transferred to another unit; 6 in camp; 8 in hospital; 2 in detention; 3 returning to Australia; 1 discharged; 2 Killed in Action. 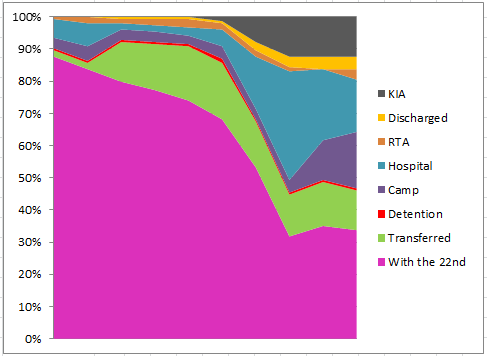 Image shows the change in status of the 154 men from the 5th/22nd after they were Taken on Strength into the 22nd Battalion on 8th January 1916 to the end of June 1916. 30th June 1916: 2493 Pte Batton discharged from hospital and rejoins the Battalion. 29th June 1916: As part of the successful 6th Brigade raid on the night of 29th/30th June 2348 Cpl McLeod,2360 Pte Ross, 2413 Pte Sullivan, and 2488 L-Cpl Robbins took part in the largest raid conducted by the AIF during this phase of raiding ahead of the Somme offensive. L-Cpl Robbins became the first member of the 5th/22nd to be awarded for gallantry when cutting the enemy wire under fire and bringing back the wounded and received the Military Medal. Elsewhere having been transferred to the 60th Battalion in Egypt, 2390 Pte Silver, 2477 Pte Sheldrick, and 2496 Pte Kendall disembarked the Kinfauns Castle at Marseille. 26th June 1916: 2351 Pte McIntosh and 2412 Pte Smith are wounded in action, Pte Smith with a shell wound to the left leg; elsewhere 2389 Pte Seddon, having been transferred to the 2nd Pioneer Battalion, is charged with Falling Out of March without permission – forfeit of 1 days pay. 25th June 1916: As a result of the continued heavy German bombardment, 2493 Pte Batton is wounded in action, with a shrapnel wound to the head. Pte Batton, the first of the 5th/22nd to be wounded, would return and go on to be the most decorated member of the 5th/22nd during the war. 24th June 1916: During a period of heavy enemy bombardment while in the Firing Line in the Rue du Bois salient, 2339 Pte Hogan and 2340 Pte Hosking are killed in action, the first members of the 5th/22nd to be killed during the war. 23rd June 1916: 2474 Pte Nelson discharged from hospital to Base duties. 20th June 1916: 2504 Pte Wakley Field General Court Martial for being absent without leave on 7th & 8th June. In guard room waiting trial 14 days. Awarded 90 days Field Punishment Number 2 & forfeiture of 106 days pay. 19th June 1916: The first of the 5th/22nd to be transferred to England, 2418 Pte Skeehan is admitted to No.3 London General Hospital. 18th June 1916: 2395 Pte Sheehey is sent to 2nd ADBD Etaples; 2418 Pte Skeehan embarked for England on HS Aberdonian; having been transferred to the 60th Battalion in Egypt, 2390 Pte Silver, 2477 Pte Sheldrick, and 2496 Pte Kendall proceeded to join the British Expeditionary Force from Alexandria on the Kinfauns Castle. 14th June 1916: 2475 Pte Myers transferred to 2nd Pioneer Battalion where he joined his elder brother Ernest who was also transferred from the 22nd Battalion to the 2nd Pioneers earlier in March. 12th June 1916: 2444 Pte Wilson disembarked HMT Arcadian with the 49th Battalion at Marseille; in Egypt 2501 Pte Shave transferred to No.1 Auxiliary Hospital, Heliopolis – rheumatism and valvular diseased heart. 10th June 1916: 2486 Pte Barton and 2487 Pte Payne charged with drunkenness while on active service. Both men awarded 14 days Field Punishment Number 2. 7th June 1916: 2474 Pte Nelson admitted to hospital with cellulitis and abscess. 5th June 1916: 2444 Pte Wilson, having been transferred to the AIF 4th Division and 49th Battalion in Egypt, proceeded to join British Expeditionary Force from Alexandria on the HMT Arcadian. 4th June 1916: 2486 Pte Barton Absent without Leave from fatigue. Awarded 10 days Field Punishment Number 2. 2nd June 1916: Upon return to Australia, 2502 Pte Sharples sent to Pentridge Prison in Coburg to serve his sentence. 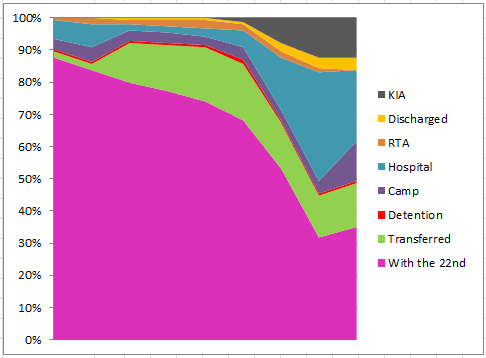 Image shows the change in status of the 154 men from the 5th/22nd after they were Taken on Strength into the 22nd Battalion on 8th January 1916 to the end of May 1916. 31st May 1916: 2340 Pte Hosking tried by Field General Court Martial on charge on drunkenness. Found guilty and awarded 14 days Field Punishment Number 2; 2497 Pte Kerr tried by Field General Court Martial on charge of disobeying the lawful command of his superior officer– sentenced to 5 years Penal Servitude; 2502 Pte Sharples arrived back in Australia to begin his prison sentence. 28th May 1916: 2402 L-Cpl Smyth reverted to ranks on own request. 26th May 1916: 2474 Pte Nelson charged with drunkenness and awarded 28 days Field Punishment Number 2; 2503 Pte Horner charged with going Absent Without Leave and making a false statement to a superior officer – awarded 28 days Field punishment Number 2. 22nd May 1916: 44 year-old 2429 Pte Tobitt is the first of the 5th/22nd to be discharged, medically unfit; 2504 Pte Wakley Courts Martial – found not guilty. 18th May 1916: 2497 Pte Kerr charged with disobeying the lawful command of his superior officer. 17th May 1916: 2496 Pte Kendall, now with the 60th Battalion, is admitted to the 8th Field Ambulance in Ferry Post, Egypt, with conjunctivitis. 15th May 1916: 46 year-old 2479 Pte Wilson admitted to hospital with trench fever; in Egypt 2501 Pte Shave admitted to No.2 Australian General Hospital with sciatica. 14th May 1916: 2434 Pte Taylor disembarked the ‘Runic’ in Melbourne, being medically unfit for front-line service. 32 year-old Pte Taylor was the fifth of the 5th/22nd to return home, eight months after leaving Melbourne on the RMS Osterley. 12th May 1916: 2362 Pte Roberts, 2374 Pte Schinck, 2463 Pte Baker transferred to Trench Mortar Battery; in Egypt 2492 Pte Sharples admitted No.3 Auxiliary Hospital, Heliopolis – hernia, and 2501 Pte Shave discharged from hospital to duties. 10th May 1916: 2455 L-Cpl Ware reverted to ranks at own request. 29th April 1916: Following his Field General Courts Martial in February 2502 Pte Sharples returned to Australia on Seang Bee from Suez, to serve his sentence of one year hard labour. 22nd April 1916: 2400 Pte Sawyer charged with Breaking from the Ranks. Awarded 28 days Field Punishment Number 2 and forfeited 28 days pay; 2415 Pte Shaw charged with Marching off Parade. Awarded 96 hours Field Punishment Number 2 and forfeiture of 4 days pay; 2504 Pte Wakley charged with being Absent Without Leave as Company moved off to trenches. Awarded 28 days Field Punishment Number 2. 20th April 1916: 2477 Pte Sheldrick and 2496 Pte Kendall having missed the sailing from Egypt with the 22nd Battalion due to sickness were transferred and Taken on Strength to 60th Battalion, AIF 5th Division at Duntroon Plateau, Egypt. They would later meet up with 2390 Pte Silver and be destined to take part in the first major engagement by the AIF in France at Fromelles. 30th March 1916: 2454 Pte White disembarks SS Simla at Marseille; 2501 Pte Shave, having been transferred to the 6th Training Battalion in Moascar is admitted to 3rd Auxiliary Hospital Heliopolis with lumbago. 29th March 1916: 2390 Pte Silver disembarks the ‘Kinfauns Castle’ at Marseille harbour. 26th March 1916: The 5th Reinforcements 22nd Battalion together with the rest of the battalion disembark the ‘Llandovery Castle’ in Marseille Harbour, to begin the journey north through France and the battlefields of the Western Front. Meanwhile back in Alexandria, 2nd Lieutenant Evans proceeded to join British Expeditionary Force from Alexandria on the ‘Megantic’. 25th March 1916: As the ‘Llandovery Castle’ ties up in Marseille Harbour, 2426 Pte Turner disembarked and was taken to hospital sick with tonsilitis. 23rd March 1916: 2454 Pte White, having been transferred to 1st Field Bakery, embarked on SS Simla from Alexandria to join British Expeditionary Force. 19th March 1916: In the Egyptian port of Alexandria, the 5th Reinforcements 22nd Battalion together with the rest of the battalion of 27 Officers and 930 other ranks, along with the 2nd Pioneers and 6th Field Ambulance, board the ‘Llandovery Castle’, destination France. Unbeknown to the men at the time, the ship that they had just boarded would later be embroiled in one of the most controversial incidents of the First World War. In June 1918 and while operating as a Canadian Hospital Ship, she was torpedoed in the Atlantic Ocean. 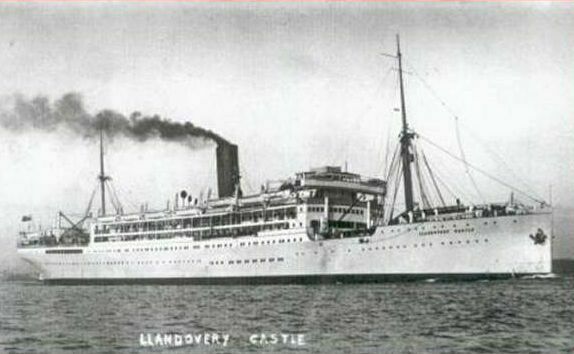 The German U-boat Captain, believing that there were eight American Flying Corps Officers on board, picked up and questioned the Captain of the Llandovery Castle, and trying to destroy the evidence of the sinking shot many of the survivors in the lifeboats. Many Canadian medical staff and nurses were killed, with only twenty-four people surviving the attack. 15th February 1916 : 2502 Pte Sharples (photograph right) Field General Court Martial held at Brighton Beach, Canal Zone. Charge: An act to the prejudice of good order and military discipline in that when on active service on the 7th January 1916 uncoupled the carriages of a troop train while in motion en route Palais de Koubeh to Tel-el-Kebir. Plead of Not Guilty. Found Guilty. Sentence Imprisonment with Hard Labour for 12 months. Confirmed Colonel Gwynn, 6th Brigade. Sentence later reviewed in March by Maj-Gen Legge (2nd Div) and Lieut-Gen Godley (I Anzac) and upheld. Witnesses included 2431 Pte Tatnall, 2357 Pte Robbins, 2375 Pte Smith, 2461 Pte Lamont, 2429 Pte Tobbitt, and Capt Pedler. 2414 Pte Sharples acted in his brothers defence, and the prosecutor was Capt Wiltshire, Adjutant of the 22nd Battalion. Pte Sharples was returned to Australia to serve his sentence in Geelong Gaol. On the 11th January 1917, Pte Sharples writes a request to re-enlist. Following his 12 months in prison his discharge branded him as a ‘bad character’ which he saw as a life sentence. He had two brothers serving in France, both of whom at that time had been wounded, with 7367 Pte Sharples being killed in April 1918 when he returned with the 8th/24th. Pte Sharples requests for an opportunity to ‘faithfully serve my King and Country and earn for myself a clean and honourable discharge’. On 12th January it is approved and Pte Sharples is released on 24th January 1917 and rejoins as Pte 3470 Sharples of the 57th Battalion. 29th January 1916: 2329 Pte Carmody, having failed to make the sailing with the rest of the 5th/22nd on the RMS Osterley in September 1915, is attached to 12th Battalion, regimental number 4215 and sails on HMAT Runic. 22nd January 1916: 2454 Pte White transferred from the 22nd Battalion to 1st Field Bakery. 20th January 1916: Having suffered from exhaustion and diarrhoea upon disembarkation at Alexandria, and then later admitted to 3rd Auxiliary Hospital with rheumatism on Christmas eve, the 44 year-old 2499 Pte Phillips boards HS Karoola for return to Australia as not being fit for service. Pte Phillips is an example of many keen men that took advantage of the raising of the age limit during the great enlistment campaign of 1915 to ‘do their duty’, but unfortunately this increase of age and subsequent drop in physical standards put an extra burden on the all ready overstretched medical staff and facilities, and as a result many returned home before seeing action. 8th January 1916: Six months after walking into the recruitment halls in Melbourne and enlisting in the AIF, the 154 men of the 5th Reinforcements are Taken on Strength into the 22nd Battalion. 7th January 1916: With the 22nd Battalion gathering in Tel-el-Kebir in the Egyptian desert, the remainder of the 5th Reinforcements and others were on a troop train travelling from Palais de Koubbeh to Tel-el Kebir. A call came down for the brakes to be put on because of some form of accident, but 2502 Pte Sharples and 2185 Pte Morgan acted by uncoupling their truck from the leading truck. Pte Sharples having worked in civilian life with Victorian Railways thought that uncoupling the train would apply the brakes and bring it to a halt, but this was not the case, and was deemed by experts to be either ‘mad or evilly inclined’. Both Privates were placed under arrest and would later be charged. 6th January 1916: 2389 Pte Seddon admitted to hospital sick with influenza.